Drain the water and grind this into coarse thick paste along with red chili, salt and asafoetida. Do not add much water while grinding. Grind this as we do for aama vadai. Soak the ingredients for morkuzhambu . Soak the toordal, ginger, red chili, green chili, coriander seeds for 15 minutes. Grind this into a fine paste along with coconut. Add little water while grinding. Whisk the yogurt and add 1/4 cup of water to this. Add the ground paste to this. In a pan add this yogurt mixture and keep the flame low. Stir in between. This gravy should not boil. When the gravy froths up switch off the flame. Meanwhile heat a pan with oil to make the bondas. Take a small portion of the batter and drop it in the oil. No need to make this in to any round shapes. Cook this in a medium flame and when it becomes nice golden brown colour take it out from the pan. Transfer this to the hot morkuzhambu. Repeat the same for the rest of the batter. In a pan add coconut oil and temper with mustard seeds and 1 red chili. When the mustard crackles add this to the morkuzhambu and mix well. A simple fried papad or vadam will be a best accompaniment for this morkuzhambu. Bonda batter should not be too thick ,else it will be very hard while eating. 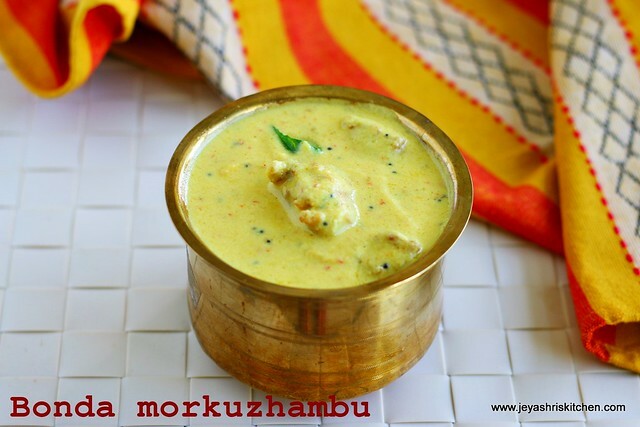 Ensure that the morkuzhambu is not very thick, as it gets more thickened after few minutes of adding the bondas. Always add when both the morkuzhambu and bondas are hot. This way the flavour will get infused more into the bondas. You can skip the bondas and make plain morkuzhambu too. Mam..y u dint add seeragam while grinding the paste for morkuzhambu? Since we are adding coriander seeds, no jeeragam in this morkuzhambu.